So, I have a confession to make. Sometimes, I ignore my growing pile of painting requests and do something for me. I say "for me", only in the sense that it makes me happy, or it allows me to pursue an artistic instinct that I happen to be feeling in the moment. 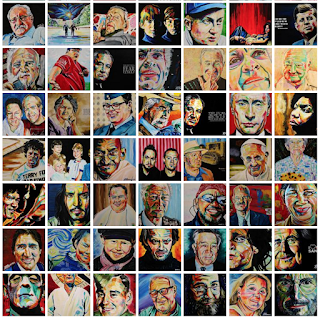 As I look at the thumbnails of my completed works (viewable by clicking here), some of the on-a-whim portraits include Pope Francis, Justin Trudeau, Jack Nicholson and Johnny Depp. There are certain images that just grab my attention and won't let go. That's what happened this morning when Matt posted a photo of his grandfather, Rev. Harry Ploughman. I saw it and instantly posted that it was "a painting waiting to happen". 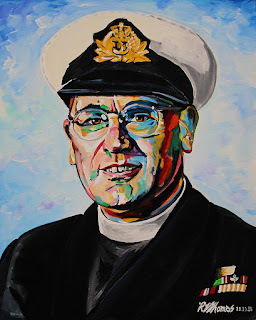 I eventually acquiesced to this pull to paint a veteran as my way of "remembering" on Remembrance Day and spent the morning and part of the afternoon with this former Chaplain of the Fleet. I need to listen to my creative urges, as they do several things. First of all, the help me grow as an artist. Secondly, they fuel me for the commission and charity work. Everything fits together and projects in the request pile will each have their time on the easel. It's important that I feel that the moment is right to begin every portrait. For instance, I'll be tackling a rather difficult family portrait this weekend that I've been putting off for some time. However, something clicked, and all of a sudden I know this is the right time to do it. "You paint so much," said Ben earlier today. "Do you ever get tired of it?" It was a great question. I guess the answer is that as long as I give myself the latitude to follow my instincts and buffer more difficult projects with ones that are more fun, I think the answer is will continue to be "no". That is not to suggest for a second that I don't get tired and worn out; I absolutely do. But I'm pretty good with managing my energy and making sure I'm in the right head space before going in the studio. It would also be a complete lie if I said that my confidence never gets shaken; it does, often. However, the more I do this, the less difficult it becomes and the more I learn. Long story short, I will continue to mix commission and charity work with paintings that I want to do, just because. I like the anticipation of who might step forward and want it. I love the feeling of responding to a creative impulse and seeing it through to completion.